Golowan | Cornwall For Ever! The Golowan Festival is one of Cornwall's biggest events. It is held in the week nearest the 21st of June every year. The festival is a combination of community events, art, music and traditions that were once common across Cornwall, especially in the Mount's Bay area. The festival’s “big weekend” stretches over three days: Mazey Eve, Mazey Day and Quay Fair Day. Read more articles in our book. Mazey Eve is held on the Friday, and during the evening a “Mock Mayor” is chosen from among the people celebrating. This Mock Mayor traditionally becomes the leader of the festival and was supposed to make fun of the real town council and other town politicians. The election is followed by a big firework display near the harbour area, which is the oldest part of the town. Mazey Day follows on Saturday, with processions and parades led by the Golowan band. Local schools and community groups dress up especially for the processions, and you can also see many bands and music groups from all over Cornwall and the rest of the world. The day finishes at 5pm with the ‘Men and Maids’ serpent dance, which is a dance traditional to Penzance. Hundreds of people link hands and form a long line like a snake dancing in circles down the town’s streets. The last day of the festival, Quay Fair Day, takes place on Sunday and is a relaxed day with stalls, fairground rides and entertainment in the harbour area. The day is based on the celebrations that used to happen in the Penzance area on Midsummer’s Day. CONTRIBUTE TO THIS ARTICLE BY EMAILING YOUR IMAGES, VIDEOS OR TEXT TO CORNWALLFE@GMAIL.COM. Over centuries, the Cornish have made history and led global change. Now, some of Cornwall’s most famous figures imagine what the future might hold. Cornwall For Ever! began life as a book, published to celebrate the Millennium in the year 2000. 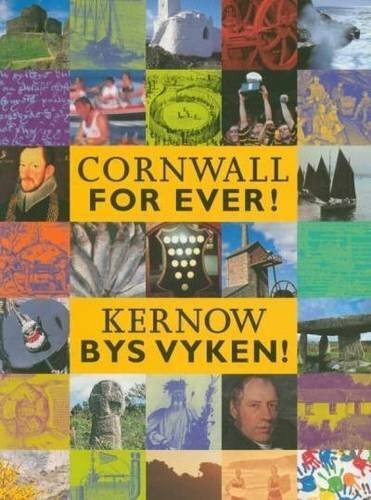 This book was given as a gift to schoolchildren across Cornwall. © 2019 Cornwall For Ever!